At last, the resution of eternal puzzle: WHY PEOPLE LAUGH. 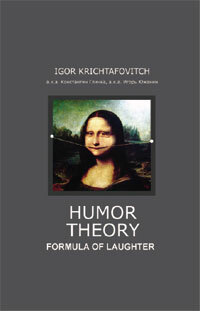 Igor Krichtafovitch discovered a formula of laughter. As it turned out, humor is a weapon. Humor is a bloodless verbal fight aiming to raise your status and strengthen your position. Even a friendly banter is a sort of intellectual clash, a kind of training before serious battles. In fact, we try to figure out who's the boss in the family when we poke fun at our loved ones. "If laughter is akin to aggression, why women have a liking for jesters?" "A sense of humor is a strong male quality. It is a sign of good intellect. Evolution stakes precisely on the intellect since a smart fellow has more chances of survival. That is why a sense of humor can be a much bigger sign of masculinity than the pumped-up muscles". The formula of laughter is primarily for comedians, writers who write satirical pieces, politicians and for people with strong sense of leadership. A good joke can effectively entice the voters. C - complexity of a joke. The higher degree of complexity the better provided that your audience can solve the problem within 1 or 2 seconds. T - time spent by a person solving a joke. The longer the time, the weaker the effect. BM - background mood. A joker can have an advantage if an audience enjoys the show. However, a real good joke can "blow up" the most dismal audience. Dr. Igor Krichtafovitch is a renowned scientist in the field of high voltage electrical engineering and air purification. He came to the US in 1994 after successful career in the former Soviet Union. Author of dozens of International patents and scientific publications. Also the author of numerous articles on Christianity and science. Well known satirical poet, wrote many parodies and epigrams (all in Russian).